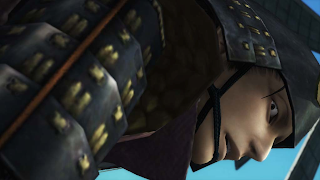 Capcom weren't kidding about increasing the pace of Sengoku Basara 4 information! I've had a lot of incoming newsletters to sift through this morning; here are the highlights. Tokyo Game Show is coming up soon and Capcom announced today that they'll be showing off an early playable demo of Sengoku Basara 4 at the event. There will also be a Sengoku Basara 4 stage presentation with details yet to be confirmed. To add to the fun, Capcom is recruiting fifty 'My Capcom Supporters' to report on their booth via Twitter with the incentive of receiving priority access to the playable game at the show. The application period ends at 23:59 on 28th August 2013. This is one of many times that living in Japan would be convenient. For the benefit of anyone reading these news updates as they come in without seeing old posts, Capcom's Sengoku Basara 4 official website was updated this morning with details of the enemy formations and new characters revealed in this week's Famitsu magazine. The next website update is scheduled for Thursday 29th August 2013, which is when the profile pages will open up for the four new characters. I updated yesterday's post with a translation of the Famitsu article overnight and a small picture of Kojuurou someone posted on Twitter. Famitsu have since added a report to go with the magazine article, with more pictures. Interestingly there's also a little more text for Mitsuhide whose coverage in the original was rather sparse. 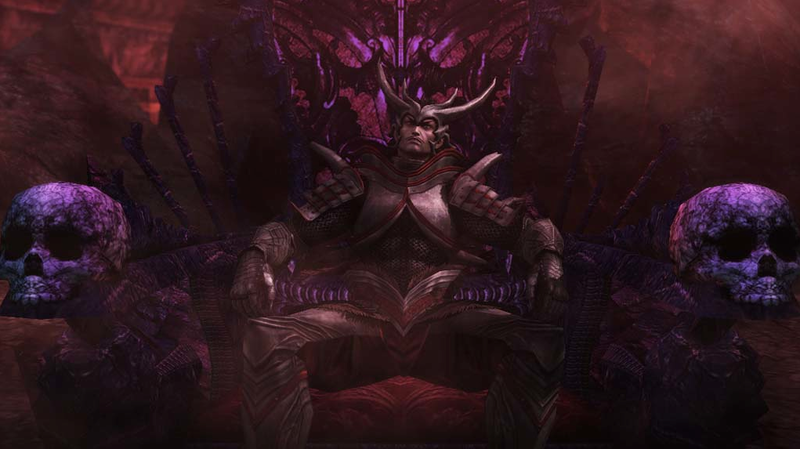 A line has been added to his description noting that he moves separately to the main Oda forces with unknown intentions. Right at the bottom where Mitsuhide and Nobunaga are together in a burning building (presumably Honnouji), the caption asks whether someone else has appeared in front of Mitsuhide at that moment? Gamer and 4Gamer have also since updated to add their own coverage. I completely forgot to do this for Matabee! 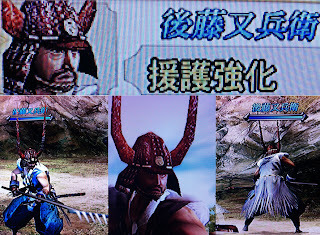 Here are some terrible pictures showing his previous incarnation as a non-playable ally/bodyguard in the Sengoku Basara 3 era, where he was linked to Kanbee's army. They chose a different kabuto crest when they changed him to be a playable character and he used to brandish a rake-like spear; there's very little resemblance to his proper design. Still, it's interesting to look back. The shabby, torn jinbaori he wore was a similar colour if nothing else. Kojuurou has had a few slips lately too, from 'Kataoka Kojuurou' on the last Amazon CD listing to the even more bizarre version chosen by a shop. Then there was Masamune's BSR48 poster with the misspelt English which had to be corrected. Is the Date army cursed..? Oh my god, those typos(? how do you accidentally go from "kura" to "oka"?). ^^;; Poor Kojuurou. The news this time disappointed me a bit but the screens makes me lol for some reason! Watch out Masamune, flying apeman!! "Oh noes, someone be stealing my Dracula-throne." I wonder what could possibly shock Mitsuhide and Nobunaga so much. The latter even changes his expression for once. I have a feeling that they're just reacting to Yoshiteru turning up in the middle of their climactic encounter at Honnouji, but it shall be interesting to find out whether that's correct. I'm loving the atmospheric feeling of Nobunaga's screenshots!